Facebook’s payments feature for the Messenger app has been rolling out slowly across the U.S. and landed in New York City today armed with a couple new features. But how does it stack up against Venmo? I repaid a $5 happy hour debt to fellow Gotham-dwelling Gizmodian Darren Orf to find out. First introduced back in March, the payments feature allows you to instantly pay or receive money from your friends. But two new features make it even better. 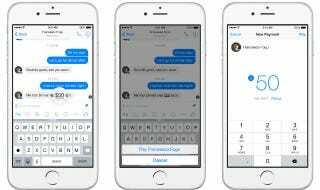 Now, if you’re having a conversation with someone in Messenger and type out a dollar amount, it automatically turns into a hyperlink. Click it, and you’ll instantly be prompted to pay the person that amount. This also works in a group chat: If you’re chatting several people on the desktop version of Messenger, you can pay individuals without leaving the chat. Everyone in the conversation will see who paid whom. I took the updated version for a spin and found it easy to use, plus doing it in a messaging app is pretty organic. I opened Messenger and clicked on an already existing chat thread with Mr. Orf. Here, I could file my truant $5 payment for a long-ago imbibed IPA. I had two options: Click on the new dollar bill icon to initiate the transaction, or, thanks to today’s update, type something like: “$5 for beer sry dude.” The $5 auto-morphs into a link, just as an address or phone number would. Darren confirmed payment and collected his virtual moolah. Making payments this way, as opposed to in an app like Venmo, is convenient: I could see it making sense for when you’re talking with a group about who owes what after a dinner everybody planned earlier in Messenger. But for folks who already have Venmo on their phone, Messenger payments might be kinda pointless. After all, you have to re-enter your debit info, again, into a separate app, to have yet another string of personal data flying around in the ether. On the other hand, it might be a more streamlined process, assuming you’re already Facebook friends with your payees. You don’t have to add them to the service. The Messenger payment function is also kinda nice, because unlike Venmo, there isn’t an obnoxious newsfeed of payment activities between your friends and strangers, filled with inside jokes and emoji-speak. With the Messenger update, only the other folks in a group chat will be subjected to your happy hour payback transactions. Does this mean paper money is even closer to reaching “endangered” status? Or that Facebook tightens its death grip on us all? Maybe both, but if you hate carrying cash like many people, you’re good either way.